It is amazing how many applications the theory of Electromagnetics has in today’s world. If Faraday and Maxwell have a chance to view the number of devices that makes use of their discovery, they will be simply blown away. Simply by the impact of their discovery in today’s world, many scientist believe that these two men were probably the most important people to have inhabited the Earth since 1600. You don’t have to take my word, you can read more about their impact here. In this short note, I want to explain the concept of metal detector and how it uses Electromagnetic principles for its functioning. More important we will see how an electromagnetic software like EMS can help companies that design and build Metal Detectors. The principle of metal detector is quite simple and as the name suggest it is a device that can identify if metals are present say in hard to find places like under the soil, inside rocks etc. It finds its use in detecting things from land mines (really a wonderful use of metal detector which has saved many thousands of life and is still continuing to save) to gold mines. Most metal detector have 2 coils – one coil carries alternating current usually at very high frequency (1-10 KHz) and other coil acts like a receiver. The excited coil generates a magnetic field and this induces a small amount of current in the receiver coil. This current (also called as Induced current or Eddy current) is known and calibrated. Now when you take this arrangement near a metallic (or ferromagnetic) substance, two things happen. First, the excited coil also induces an eddy current in the metallic (or ferromagnetic) substance. This eddy current produces its own magnetic field that opposes the magnetic field produced by the coils. This causes the eddy current in the receiver coil to drop. A sensor senses this drop in eddy current from the expected value and gives a signal indicating the presence of a metallic substance. In the figure below, the orange coil is the excited coil and the green one is the receiver coil. High frequency AC current is circulated in the orange coil and the eddy currents induced in the green coil in the absence of any metallic substance is calibrated. For an engineer, several design factors need to be considered before this concept can be made into a functional product and that is where SOLIDWORKS CAD and EMS Simulation software can play a vital role. Let us look at some of them. What is the right size of the coil? What frequency and magnitude of AC current should be applied? What is the induced current in the receiver coil under ideal (no metal in the vicinity) conditions? How can I package the entire arrangement into a product? Together with SOLIDWORKS, the EMS product can help a designer answer all the above questions. 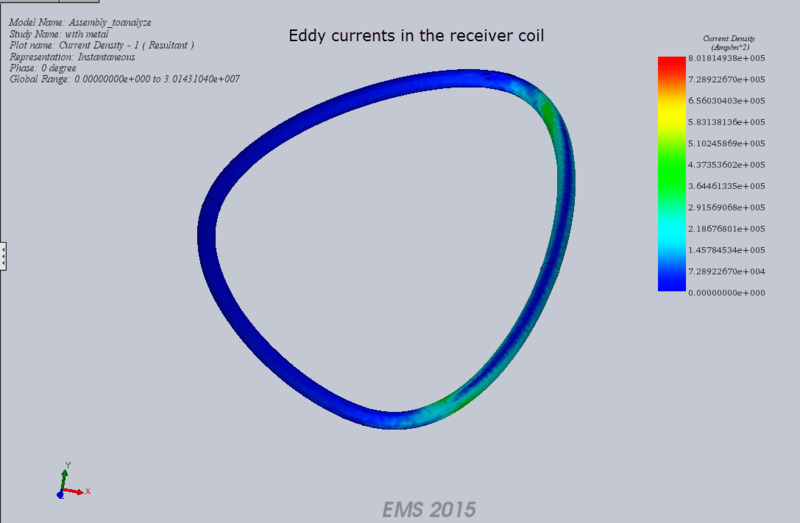 Once a concept coil is arrived at, it can be tested virtually using EMS to visualize all the engineering parameters. 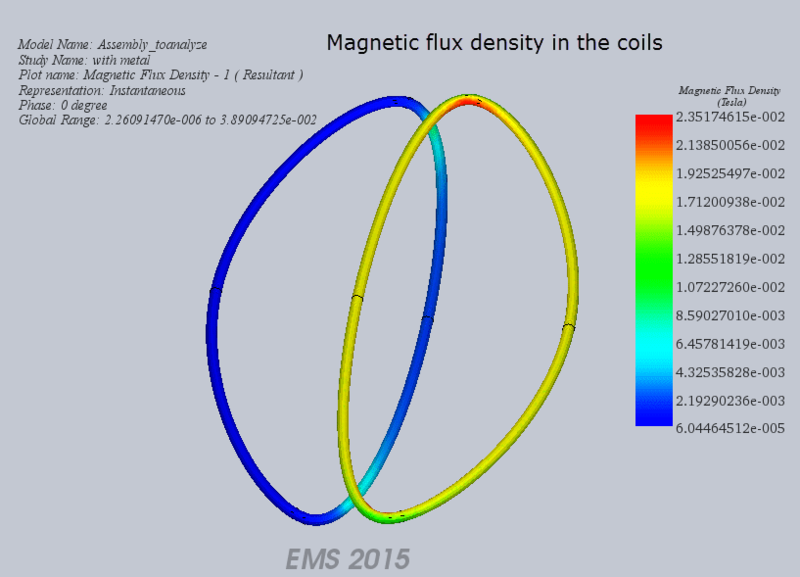 For example, engineers can visualize the magnetic flux density in the coils as shown in the figure. EMS product will also give you the value of the induced current in the receiver coil. Most importantly you can model different hypothetical situations like what happens to the induced current in the receiver coil when you come across a metallic object at a particular distance from the coil. 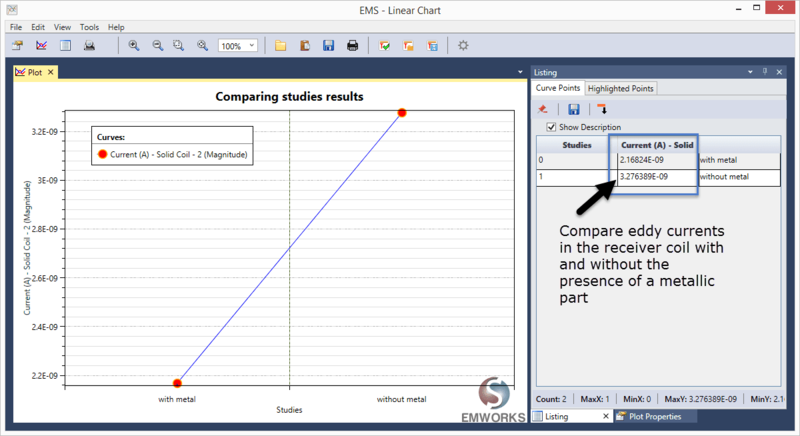 EMS can also compare the induced eddy currents in the receiver coil when a metallic part is present and when it is not present. This way the product can be perfected before a prototype is made and tested. The advantage of using Simulation in product development is well studied and many engineers have got impressive results by using this approach. First of all the time taken to bring a concept to the shelf is greatly reduced. Next, the cost of product development is lower as the number of prototypes required to perfect the product is greatly reduced. For most companies which uses this approach, their first prototype with some minor tweaks invariably becomes their final product. Finally, this approach enables innovation in product development as many what-if scenarios which an engineer conceives can be tested thoroughly and the best design can be chosen. 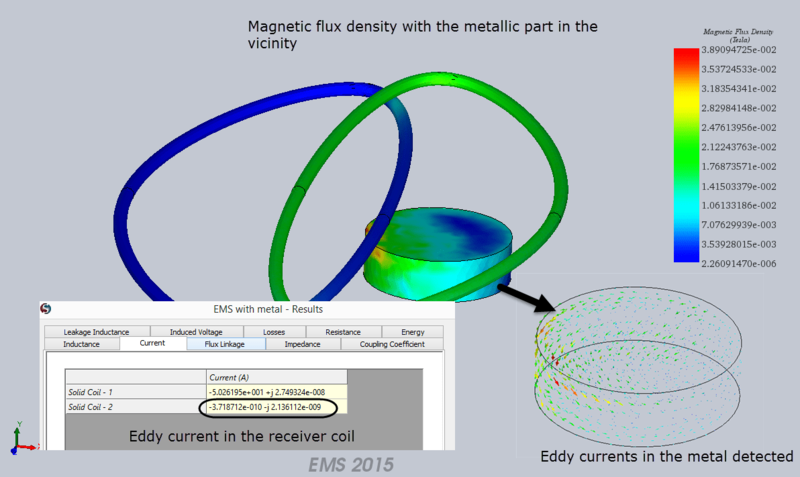 EMS for SOLIDWORKS is the first and only completely embedded Gold Certified software for SOLIDWORKS which helps SOLIDWORKS users study their magnetic, electric and electromagnetic designs seamlessly. It can utilize the geometry created using SOLIDWORKS directly for simulation. Its user interface emulates SOLIDWORKS and hence there is no learning curve associated with the EMS software for SOLIDWORKS users. Please click here to try out EMS for SOLIDWORKS and see how it can help you design better products. For more information visit www.emworks.com.